Rattlesnakes experience the world very differently from humans. A specialized pit on the snake's face contains a heat-sensitive membrane which connects to the brain. Together, the snake's visual and heat-sensing systems work together to provide an image that combines both visual and thermal information. 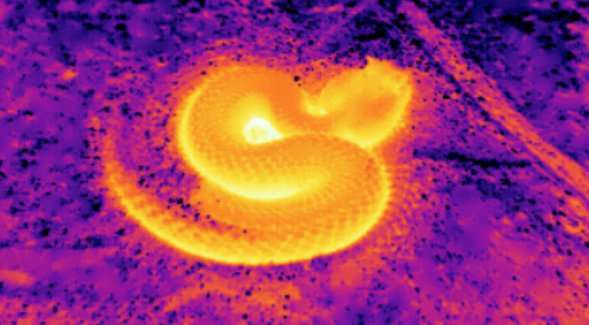 That's important to snakes, which rely on this thermal sensing to detect warm prey in cool environments. But a mystery has long faced biologists: Do these snakes prefer certain temperatures of prey to others? It's not a question of preferring their meat well-done or rare, explained San Diego State University Ph.D. student Hannes Schraft working in the lab of biologist Rulon Clark. Instead, colder prey might indicate those animals' muscles aren't ready to run away as quickly as a warmer animal might be. "Generally, the colder they are, the slower they are," Schraft said. To find out if prey temperature plays into rattlesnakes' predatory preferences, Schraft headed to the deserts outside Yuma, Arizona. He hunted down sidewinder rattlesnakes—89 in all—by following the curly tracks they leave in the dirt, then showed them the body of one of their favorite desert treats, a green anole lizard. Before displaying it to the snakes, Schraft warmed up the lizard's body with a heat lamp to a variety of temperatures and then observed whether the snake showed interest in it. If the snakes showed more interest in colder prey—though not too cold, as that might indicate a dead or sick lizard—that would provide evidence that these snakes prefer cooler, unwary prey. But that wasn't what he found. The snakes appeared to show no preference for any particular temperature of lizard, he reported this month in the Journal of Comparative Physiology A. Instead, his work confirmed previous findings that rattlers pay the most attention to temperature contrasts—a warm lizard in the cool desert night, for example. "For the snakes, seeing these temperature contrasts is like us looking at a black dot against a white background," Schraft said. That may not be the whole story, though. Nearly all the snakes he tracked for the study were juveniles, and because snakes' thermal sensory capabilities improve with age, it's possible that older snakes do discriminate between warmer and cooler prey. Schraft plans to pursue that question in the future. Solving these kinds of questions might one day help engineers develop smaller and more energy efficient infrared cameras, Schraft said. green anole lizards are not native to the deserts of the Southwestern states, and so are not a typical food item for these rattlesnakes; the fact that the scientist chose juvenile animals is also problematic.